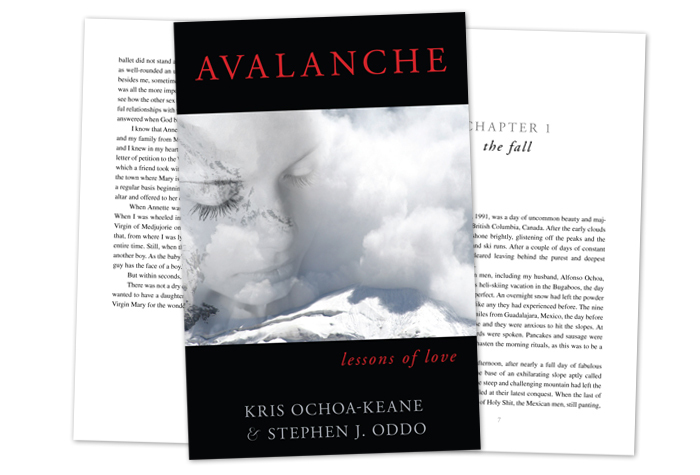 Book cover design and layout for Avalanche: Lessons of Love by Kris Ochoa-Keane & Stephen J. Oddo. “I wanted to personally thank you so much for the incredible job you did on the cover. Every time I look at the cover, a huge mix of emotions come over me. You captured exactly what I wanted to say to people when they look at the book. I cry when I look at it…because that woman is me……I don’t know if you have read the book or not, but I would love to send you a copy. It would be an honor if you read it. I can never thank you enough for your insight and talent. You are the best.